New York Giants look anything but Super Bowl contenders after slipping to 0-3. 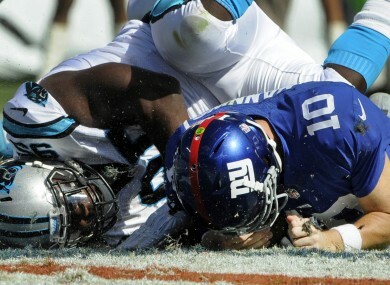 Eli Manning and the Giants have seen their Super Bowl hopes dashed in just three weeks. SOMETHING IS ROTTEN in the state of New York and, for once, it’s not the Jets. No, instead the team leaving a trail of mediocrity everywhere they go are the 2007 and 2011 Super Bowl Champions, the New York Giants. Their latest loss. Actually, loss doesn’t quite cover it. Their latest humiliation came at the hands of the Carolina Panthers who notched up a 38-0 win, a scoreline that actually flatters the G-Men. Not only was Eli Manning sacked seven ten times and hit a further 10, but the Giants offence managed just 18 total yards – 1 yard passing – in the first half. This was less a comedy of errors, more a carnival of calamity. However, it’s a performance that can come as no surprise to anyone who has had the misfortune of watching Tom Coughlin’s men this year. Before last night, in just two games, the Giants gave up 77 points. 77. In those games they rushed for a combined 73 yards. Think about that, conceding more points than you’ve managed to rush for over the course of two games. Last night, at least, they ran for 60 yards. However, 40 of those came when they were 31 points down. In those two losses, Eli Manning threw the ball 45 times a game. Little wonder then he threw seven interceptions, a figure he added two more to last night. It’s worth remembering the Giants weren’t playing the Seattle Seahawks either, they were on the road to the 0-2 Carolina Panthers whose defence rank 26th in the league. Of course, not all the G-Men’s problems are on offence . They have failed spectacularly to stop teams moving the ball on them this year too. They’ve given opposing quarterbacks far too much time to throw the ball (just three sacks) so it’s little wonder they’ve been allowing more than 375 yards per outing. Last night Cam Newton was allowed to throw for 223 yards and three touchdowns and when they weren’t being generous to the former first overall pick, they were parting the blue sea to allow DeAngelo Williams rush for 120 yards on 23 carries. There really aren’t enough synonyms in the thesaurus to describe how terrible this was. And what does it mean for Tom Coughlin and his bunch of not so merry men? Well, it likely means the Giants have 13 games in which they can assess who they’ll be drafting in 2014. Since 1978, 161 teams have started an NFL season 0-3. Just five have made the playoffs. For the Giants – as well as Pittsburgh, Washington, Jacksonville, Minnesota and Tampa Bay – this year is already done. So why am I picking on the Giants when I could just as easily have written this column about any of the above teams? Well, realistically, New York were the only team likely to make the playoffs this year so it is their star that has fallen the most dramatically. The worst thing about last night’s loss, apart from the playing, coaching, etc was that it brings an end to any chance Tom Coughlin had of extending his remarkable record of starting every season 5-2 since he took the job in 2004. Indeed, having watched their efforts so far this year, the Giants will be lucky to win five games full stop. But that’s football. That’s the NFL. The Giants will rebuild and be relevant again because if this sport is about anything, it’s about change and, to quote Walter White, that’s all of life, right? I mean, it’s just the constant, it’s the cycle. It is growth, then decay, then transformation. Email “The Redzone: They might not be Giants”. Feedback on “The Redzone: They might not be Giants”.